Great news! Globe has an early Christmas gift for all new and existing Globe Broadband subscribers. 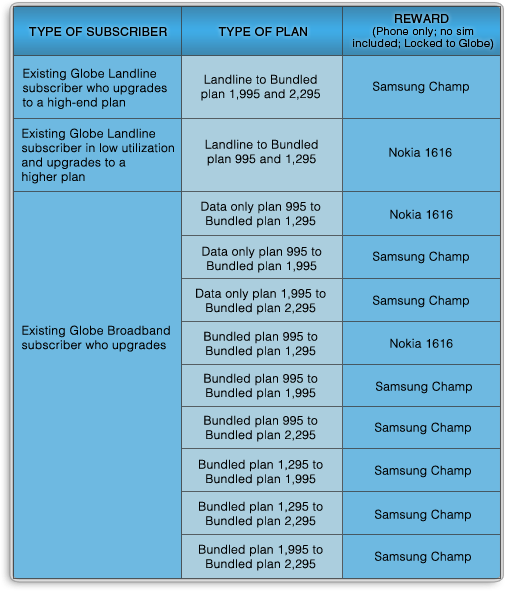 Avail of any Globe Broadband DSL plan or upgrade to a higher bundle if you already have one and receive a FREE Samsung Champ or a FREE Nokia 1616! The promo is being offered from October 16 to December 31, 2010 only. So apply for a plan now! I applied and wait for 3 weeks until now there's is no Cellular phone drop on my door step. This IS SCAM, and breaching the Consumer Act Law. but did they confirmed that you we're accepted as a subscriber? yes, and actually they'd send me my 1st billing but I'd just used the DSL package for 9 days with ON and OFF Connection. And also, they'd charged me for Installation Fee which was not supposed to be because it was clearly posted on the flyers that there is no Installation Fee. The Php 500 was just for the Advance payment and will be deducted on my 1st Billing. Am expecting of lower 1,500.00 my 1st Billing because i took the 1,995.00 DSL bundle with Samsung Champ promo. I was charge of 2, 230.00 for the 1st Billing... It was CLEARLY STATED that NO HIDDEN CHARGES, WHAT YOU USED IS WHAT YOU PAY. You are Breaching the Terms and Conditions of your own Rules as well as the Service Level Agreement for Uptime Connection. Until now I still encountering of Intermittent Connection. I believe you cant terminate the service provided that the reason you have is justifiable. I guess , based on what you said, its already enough to request for account termination. I told them the same phrase as you stated... but they are insisting to pay the whole 12months... I told them to sue me if necessary so the court will justify the truth and to have fair justice both sides. They've said it won't necessary to bring in court for any matters regarding with it, it will just waive the payment. Then I told them that how could I pay a service that won't satisfied me, from the start of installation up to date nothing happened to the intermittent connection. Until now, no one from Globe called me up for any feedback from the promotion of Globe Samsung Champ. It's been 2 Months running and there is no reality on the promotion. I wrote a letter to DTI Complaint Department regarding with my concern for the breaching the Consumer Act Law that the promotion was fall into Fraud Promotions to Attract Consumers. I got the feedback for further INVESTIGATION to the Promotion of Globe and their Services. its a good thing that DTI respond, most of the time, when I email government websites, i never ever receive any feedback at all.